After a beautiful, but long day on the road (only 170 miles, but it took an unseemingly long time to get here), we set up camp for the very first time in Rhode Island, made a quick dinner, and waited for the Supermoon Eclipse. (bold because this was a big event). Although our campsite is nestled in the trees, there’s a large open field nearby. 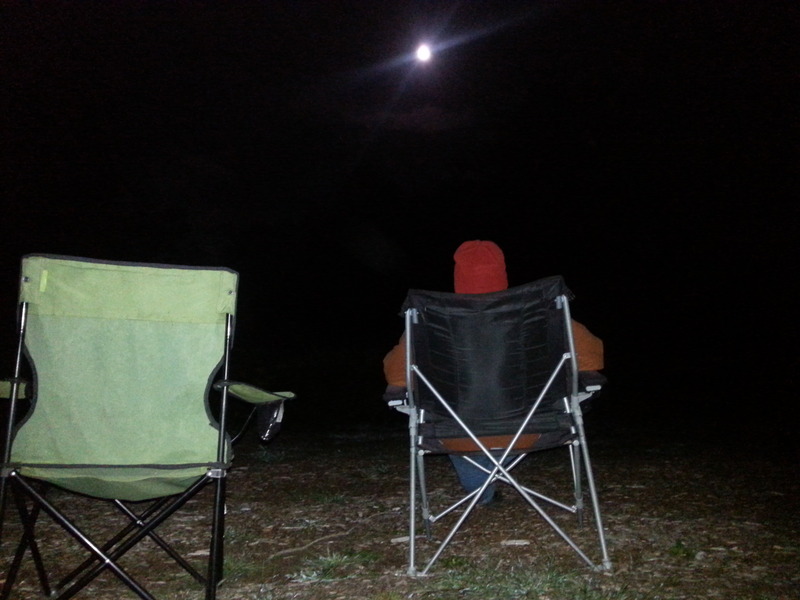 We dragged our lawn chairs out into the bright moonlight to await the big event. It went pretty much like this. Me: I think I see it starting around the 8:00 area. John: No, it hasn’t started yet. That’s just a dark area. Me: Gawd, this is taking forever! J: It’s going to be slow. The earth is big. Me: Do you think the moon would look much bigger on Mt. Everest, since they are closer? J: No. Not that much closer. Me: Damn! I can’t get a decent photo. J: The best photos will all come from the West Coast. They will see the eclipse when the moon is closer to the horizon. Me: They probably won’t be able to see it through all the smoke. Me: In the Southern Hemisphere, do they see it the same way, or does it cover from right to left, instead of left to right? John finally flips phone off, and watches the last five minutes of the shadow overtake the moon. The rosy color is beautiful, and it’s noticibly darker in the field. It’s really pretty spectacular. We notice that we seem to be the only people in the campground who are outside, or even awake. Five minutes later, John folds up his chair and heads for the Fireball. I’m going to stay outside and watch the eclipse recede. He tells me it will take an hour. Me: OK then. I’ll sit by the fire, and just check on it from time to time. I drag my chair back to the campfire and stare into the embers. After a while, I wander back out to the field to check, but I’ve already taken off my glasses, and can’t see squat. End of eclipse for the Campshaws. Let me know when the next one comes around. But, you have to admit that it was pretty cool. Hope you all saw it. This entry was posted in camping and tagged camping, eclipse, supermoon by Judy Crankshaw. Bookmark the permalink. We were with John on this. In Oregon it was a little hazy but took forever to see any change. The color was light orange- beautiful but not beautiful enough to keep us out watching for more than 30 minutes. I would make a terrible astromer -too impatient. You there would like the park where we are at now. 6000 acre cattle ranch with tons of trails and roads to ride. No eclipse visible in Alto. We could see the moon through light clouds before it started, but it was totally cloudy during the eclipse. Too bad, Gary. It was bright and red here in Rhode Island. We’ll all catch the next one….. It was overcast here. Fell asleep early, then woke up at 12:30 am, so if anything was observable I missed it! I did see the moon, shrouded in mist, at 12:30 but it didn’t look as “super” as the one we saw when we were camping this past July. We’ll just call it our Kahoutek. Eh, there will be another superbloodmoon eclipse in 20 years or so, Jen. Put it on your calendar, and promise yourself you’ll stay up to see it. What else can you do? On Cape, our viewing started about 8pm. I also took a photo but it no way illustrates what I was seeing. I finally, because it was taking so long, went to bed opening the window shade over my headboard. I had the pleasure of viewing from bed, as John slept peacefully. Finally the glow of red started and yes it was so evident there was a color up there in all that blackness. It was the color of the fur on the little fox that traverses our yard frequently. I did watch until it was fully engulfed with the ‘fox fur’ then closed my eyes. At 1:00am John got out of bed and went to the bathroom window. Laughing, Sandi. I’ll bet that’s a pretty typical long-married couples’ eclipse experience. That’s why cameras were invented. I’m with John on this one. I went out and set up to shoot photos, but there were too many clouds to get a good photo. I did see the eclipse though, through some very small gaps in the clouds, it was no big deal to me. It looked like the moon went through all the phases in one night. Worst of all, some idiot decided that I needed to listen to his phone conversation for 45 minutes as I stood there trying to get a photo. Noooo, Jerry. Don’t side with the people who bury their noses in electronic media at the expense of face to face conversation! In your case, I’d be totally annoyed at a stranger rambling on whole time you are trying to concentrate on getting your photos set up. But I’ll bet you got a free great photos that I’ll see on the blog soon. We had a clear night here, and I enjoyed the drama of the eclipse. Just wish it could have been a bit closer, so that I could still see it once I took my damn glasses off! Look outside. You’ll find it, Jochen. It was spectacular! I saw the first 3 quarters of the eclipse before the clouds came in, but then about 30 minutes later, the clouds cleared. I got a few pictures with my little instant camera which surprised me. That rosy blood moon is fabulous, mysterious, and entrancing. I can’t imagine how frightening that must have been for primitive people who had no science to explain it. The myths around the world are good evidence of their imaginations and fear. After the clouds cleared, I watched until the moon was full and white again. It took about 3 hours altogether, I think. At a few points high thin clouds drifted over the moon and created a faint, circular rainbow around the moon with barely diminishing the light of the moon. Beautiful. I was wishing I had a fancy camera to capture all the views. Did you notice the distinct shadows the moon cast? It was almost as bright as day. Wow! It was truly a Super Blood Moon and total lunar eclipse. Won’t happen again until 2033. It was a gorgeous night for viewing here, mid to high 60’s, no wind. I was thinking what a great night it would have been for a bike ride. It was amazing. We had clear skies here, so viewing was perfect. Happy to have watched it, but bummed not to be able to get any photos. At these events, I’m always happy that John studied astronomy in college. Bummer, Neil. Maybe you can catch the next one in 20 years, or whenever. :-). Don’t you hate missing these events?